Published on December 21, 2017, at 8:00 a.m.
Last year, the Kremlin announced that it’s seeking a new contract with a Western public relations firm to improve Russia’s image abroad. Considering recent headlines of Russia’s interference in U.S. affairs, one might view a contract between a U.S. firm and the Russian government in a negative light. However, the truth is that governments routinely hire PR firms to carry out advocacy campaigns in foreign countries. And the countries that are most desperate for a PR team’s help are typically the most controversial. Russia spent $115 million on Western PR firms between 2006 and 2016, with most going to Ketchum, a major multinational PR firm based in the United States. Ketchum partnered with the Kremlin between 2006 and 2014 to provide PR services with the goal of shaping perceptions of Vladimir Putin and Russia among American publics. Ketchum’s activities included effectively lobbying TIME magazine to name Putin “Person of the Year” for 2007, urging the Department of State and reporters to soften their assessment and criticism of Russia’s human rights abuses and securing an article Putin wrote about Syria in The New York Times. After Russia invaded Crimea in 2014, Ketchum ended its contract with the government, while one of its partners, Gplus, continued the contractual relationship. Is it unethical for U.S. firms to represent a country’s interests whose values do not align with American values? The answer is it’s complicated. Matt Wisla, a professor at The University of Alabama who has worked for both the American Chamber of Commerce and the PR firm FleishmanHillard in China, said those who look at the issue as a zero sum game think working with a rising power like China opposes U.S. interests. To counter that point, Wisla said that communications as a field only has so much power in regard to contributing to a country’s rise or downfall. Opening lines of communication and exchanging ideas could, however, yield better understanding between countries’ publics. “So why not identify ways to bring people together and understand each other better?” Wisla said. Mark Harris, the former VP of communications at IBM Global Business Services, has observed firsthand how multinational firms make ethical decisions. He points out two key assertions supporting the argument that firms can represent multiple clients with diverse — though not directly competitive — interests. The first is that with wider contacts, deeper expertise and a more global perspective, an agency has broader insight and can thus do better work for a client. “You want a strategic partner that can bring the broadest perspective to you,” Harris said. “If they don’t have those relationships, you could assert they’re more limited in their ability to serve your account. So for example, a company in the tech sector might be OK with its agency working with a maker of GPS devices or game systems, but not another major business-to-business provider. If a potential client has a history of not upholding standards that align with Americans’ core values, agencies have a difficult decision to make. It’s ideal to say agencies should only accept clients whose causes they support, but as we’ve learned, taking on controversial clients can have positive implications. What kind of decision-making process do firms go through as they weigh the pros and cons of taking on such a client? “Some of the criteria would be is it [the potential client] directly against U.S. policy, U.S. interests or American values? You don’t want to be counter to specific U.S. policy, interests and values when working for a foreign government for example,” explained Wisla. 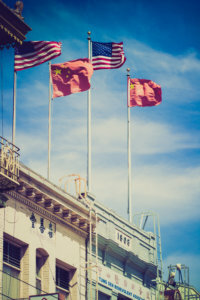 In his time working at FleishmanHillard in China, Wisla said a common reputation campaign might include posting billboards in Times Square and creating a conversation about China’s positive aspects to improve the country’s reputation and increase tourism there among U.S. publics. That is perfectly acceptable, he said. On the other hand, if a country approaches an agency in the hope of smoothing over its reputation after committing human rights violations, that is a completely different situation, and FleishmanHillard would not touch it. While these are more clear-cut cases, a vast gray area exists too. For example, everyone has a different idea of what it means to contradict U.S. interests. Wisla wonders if some would view his former firm’s decision to support China on the world stage as counter to U.S. interests. Harris said it’s rare for firms to turn away a client because at the end of the day, it’s business. However, agencies occasionally end relationships with clients, Harris said. They cite reasons for resignation such as mistreatment of staff, ethical differences, taking on a bigger contract with a competitor of that client or, in the case of Ketchum and Russia, increasingly negative attitudes among key publics. In today’s global setting, we must anticipate backlash from a variety of stakeholders, whether they’re American publics, a diverse workforce, foreign and U.S. government entities or investors. As public relations practitioners discuss the ethical, legal and reputational implications of the choices they make, they’re forming a legacy and setting standards for our field. Next Article The Trust Tsunami: Where Should You Get Your News?